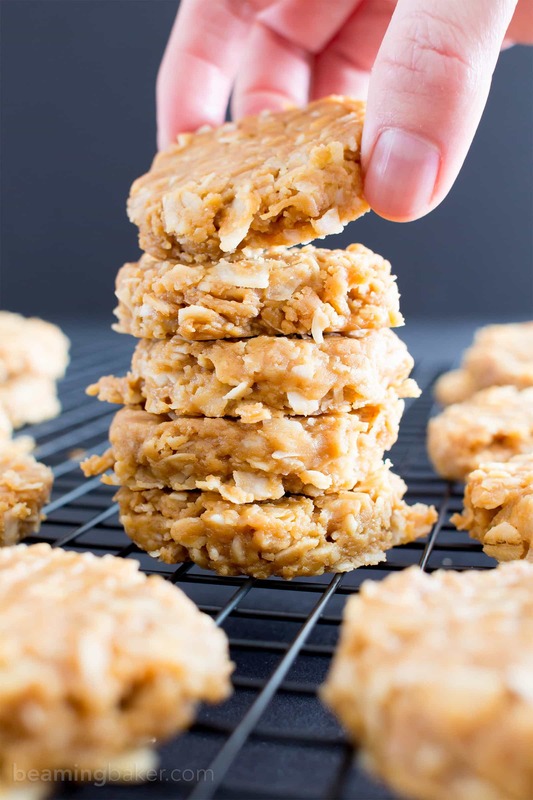 4 Ingredient No Bake Peanut Butter Coconut Oatmeal Cookies (V, GF): a one-bowl recipe for super easy to make peanut butter cookies packed with coconut and oats! 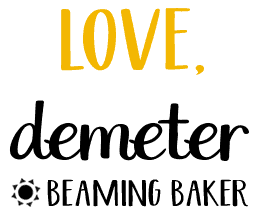 Gluten Free, Vegan, Dairy-Free, Whole Grain, Refined Sugar-Free. So lately it’s been like 1,000 degrees at home. Okay, fine, it hasn’t been an actual 1,000 degrees, but it’s been HOT. Like, Snoop Dogg would be telling us to drop all kinds of things HOT. Has it been particularly steamy where you’re at? Well, with this heatwave being all summery and stuff (yes, I just said that)… I’ve made it my mission to decrease any activity or movement that will make my apartment even hotter. Because honestly, Erik gets really testy when it’s hot. 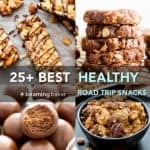 Even when there are homemade dark chocolate sea salt KIND nut bars to munch on. And now I’m even arguing with myself about how to go about these things. Do ya see what the heat does to me? But I’m kind of thinking you’re in the same boat. 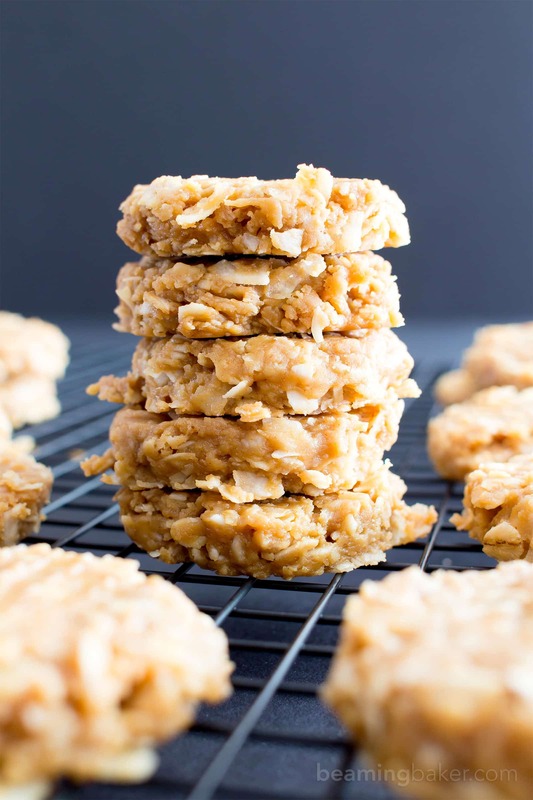 And on the chance that you are, or you just love ridiculously easy recipes, I thought I’d introduce you to my second no bake cookie recipe of all time (I know, right): my 4 Ingredient No Bake Peanut Butter Coconut Oatmeal Cookies. But my very favorite request (which I got multiple times) was for a coconut-upgraded version. 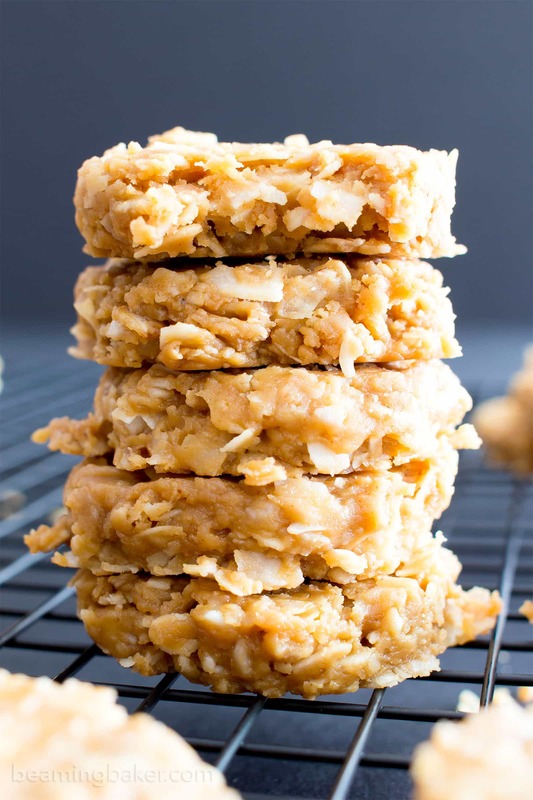 And since we all love peanut butter oat coconut everything ‘round these parts, that’s what we’re whipping up today. seriously tasty and stay that way for, like… ages! What’s your favorite way to cool down? 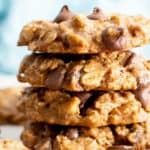 4 Ingredient No Bake Peanut Butter Coconut Oatmeal Cookies (V, GF): a one-bowl recipe for super easy to make peanut butter cookies packed with coconut and oats! Gluten Free, Vegan, Whole Grain, Refined Sugar-Free. Chill in the freezer for 15-25 mins, until firm. Enjoy! Storing instructions below. 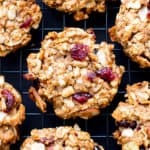 - Adapted from my No Bake Peanut Butter Granola Bars and my No Bake Peanut Butter Oatmeal Cookies. - Here’s the wonderful cookie scoop that I used in this recipe. - Store in an airtight container at room temperature or in the refrigerator for up to 1 month. The texture will be about the same in both environments. 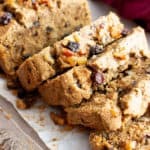 - More Peanut Butter recipes (all v, gf, df): 2-ingredient peanut butter fudge, chocolate peanut butter crunch bars, no bake peanut butter chocolate chip cookie dough bites. It has been hitting 30C these past couple of weeks, but now we’re back to our usual miserable British rainy, cloudy weather LOL hopefully it’ll warm up again soon! 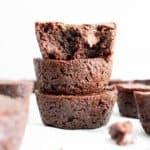 Made these tonight and they are SOOOOO good! 🙂 Thank YOU!!! I’m so happy to have stumbled across your blog. It’s exactly what I’ve been looking for since I found out that I have Celiac disease. I can’t wait to try your recipes! I’ve tried a lot! Just made the one bowl pumpkin bread for company was AMAZING people didn’t believe it was gf vegan! Have done plently other favorites too 🙂 thank you! That’s SO WONDERFUL to hear, Molly! Thanks for following up and letting me know. It’s always so fun to see comments as you go through the site, trying each recipe. Enjoy. ???? I am so wanting to make these right away, they look absolutely delicious! But, no maple syrup in the house 🙁 However, I do have IMO (syrup) is there any chance I can replace the maple syrup with the IMO?? If so, how many grams? Thank you for all your delicious recipes and inspiration! Thank you so much! Hmm… I’ve never used IMO syrup before, so I can’t say. 🙁 I suggest making a smaller batch (a half or quarter batch) with a 1:1 swap for the maple syrup. 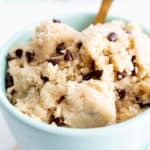 If it tastes good and the texture is to your liking, proceed with a full batch. If not, we can discuss other possibilities. 🙂 Thank you so much for your sweet note and your support. 🙂 Have a great day! Keep me posted. Sorry for the slow response – vacay time with the kids..???? I made a batch with the IMO syrup.. turned out okay, but thinking I want to try them with the maple syrup next time ???? Thank you again for all your inspiration and delicious (and easy!) recipes – keep ’em coming ???????????? Hi Christina! Unfortunately, I don’t think coconut flour is going to work. Coconut flakes are much less absorbent than coconut flour. Have you tried looking in the natural/organic food section of your grocery store? Usually you can find Bob’s Red Mill coconut flakes there. 🙂 Hope this helps! Well I found some unsweetened coconut flakes and got to make these today! Talk about yummy!! Oh my goodness they are good!! Thank you so much for the recipe! ???? Can I use honey instead of maple syrup? I know they don’t exactly have the same level of sweetness and flavor. Also, I am assuming by adding sweetened coconut flakes it will only be that much more sweeter. Safe to assume this? Hi Christine! Yes, you should be able to use honey. 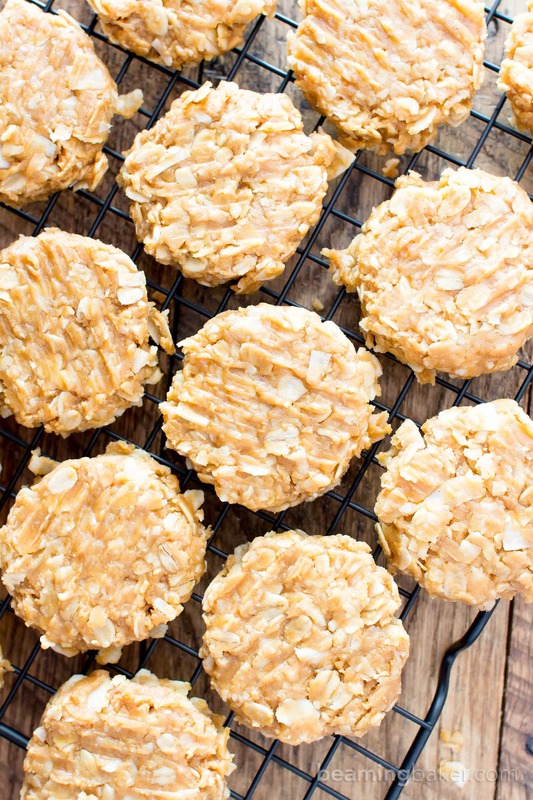 I wouldn’t recommend use sweetened coconut flakes–they’d most likely make the cookie too sweet. Enjoy! 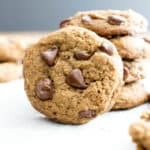 Hi, I am just wondering how crumbly they are. Do they hold well together? They do look delicious. Hi Jane! Not crumbly at all. I specifically made sure of it when creating this recipe. 🙂 For me, they’re a bit more on the softer side. Hope you get to try! Are the oats cooked or raw? I made this today, but I subbed honey for the syrup because that is what I had on hand. Yummy! Any chance agave nectar would work in place of syrup ? Fantastic! As for the chocolate: YES!! I often must convince myself not to share exclusively chocolate recipes. Lol. Hope you enjoy! Did not have honey or enough maple syrup so I used Brown Rice Syrup. 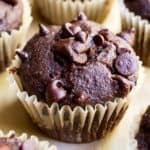 Also added 1/4 cup mimi chocolate chips. Came out great. I plan to use regular oats, not GF. Does it matter if the oats are old fashioned or quick cook? Woohoo!! I’m beyond pleased that you enjoyed these, Monica! Every time I develop a recipe, I think, “is this as EASY as possible? And as tasty?” So thank you for letting me know I’m on the right track. Can’t wait to see what you try next! 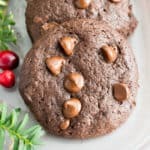 Love these cookies, they go fast in my house!! Thanks for sharing your recipe! So happy to hear it, Desi. 🙂 Thank you for stopping by and letting me know. Enjoy! These are so yummy! The main batch isn’t even out of the freezer yet but we’ve been munching away at the leftover dough that didn’t fit on the pan. I used a combination of almond butter and Nutzo because thats what I had and I added cinnamon and Raisins. Definitely recommend the cinnamon and raisin addition! Best part is I don’t feel too guilty mowing them down with my preschooler because they’re really not unhealthy! I don’t use a microwave can I heat it on the stove? Hi Michelle! Yes, you can. 🙂 The stovetop instructions are in the Notes. Enjoy! Used tahini instead of peanut butter. Worked great and have a wonderful flavor! Thanks for sharing the recipe. Woohoo! Glad to hear it Rebecca! 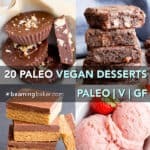 I made these tonight but I used tahini instead of peanut butter. It worked great and they taste amazing! Thanks for sharing the recipe!